Science Project _ Kinetics Experiments; Effect of concentration on the rate of reaction. Effect of concentration of HCl and NaOH on the rate of reaction with Aluminum. Two well known chemical reactions are the reaction of NaOH and HCl on aluminum. Drano and other solid drain cleaners usually consist of NaOH, and a small amount of metallic aluminum. The aluminum reacts with NaOH to form hydrogen gas. The formation of gas bubbles provides a physical action that helps unclog a drain. Anti-perspirants are made by the reaction of hydrochloric acid and aluminum. Since in this project you will learn how to make antiperspirants, it is also good to know about the possible health hazards of antiperspirants. The human body has few areas from which to purge toxins - behind the ears and knees, the groin area and armpits. Toxins are eliminated in the form of perspiration. As the name indicates antiperspirants prevent perspiration, thereby inhibiting the discharge of toxins from the armpits. Unable to sweat out these toxins, the body deposits them in the lymph nodes below the arms, causing a high concentration of toxins which leads to cell mutations - Cancer. Nearly all breast cancer tumors occur in the upper outside quadrant of the breast area, precisely where the lymph nodes are located. 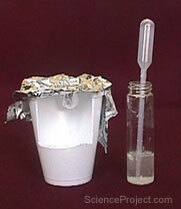 In this project you will study the effect of concentration on the rate of reaction of HCl and NaOH with aluminum. You will first come up with a method of determining the rate of reaction. You will then perform experiments to test the rate of reaction in different concentrations. Report your results in the form of graphs or charts.